By Wilhelm MurgRobby McMurtry, who was of Comanche descent, was a pillar of the community in the small town of Morris, Oklahoma. He was an acclaimed gallery artist who painted an iconic mural for the city’s library, a published author who created graphic novels, and a popular teacher who taught art to a generation of citizens at the local high school. His status made it all the more shocking when sheriff’s deputies fatally shot him in self-defense. On Wednesday August 1, the Okmulgee Sherriff’s Department responded to a call about McMurtry, 61, who was alone at the home he shared with his wife. The caller, identified simply as “a family member” by Sherriff Eddy Rice, indicated that McMurtry was suicidal. Two deputies, Chief Investigator Michael Stacy and Investigator Smokey Patchin, “found the screen door open, looked in, yelled for him; no answer,” Rice said. One of the officers spotted McMurtry in the yard; he had a machete with him. They attempted to talk with him, but McMurtry became more agitated and ran at the deputies. One deputy attempted to Taser McMurtry, but apparently he didn’t make a good connection. The other deputy had his gun drawn and shot McMurtry. He was pronounced dead at the scene. Comment: Wow, this is someone I corresponded with. I recently posted a review of his latest work. Kind of shocking to me. Someone told me there's more to the story than in this article. Maybe he was holding a carving knife, not a machete, because he was a woodcarver. Maybe the deputies shot him without (sufficient) cause. 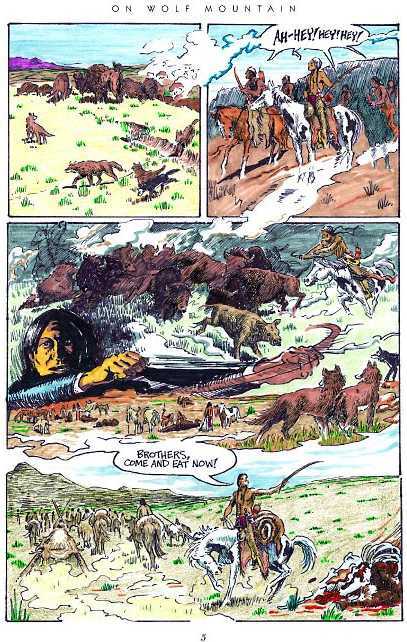 Just weeks before his tragic death, Robby finished a comics adaptation of Charles Eastman's "On Wolf Mountain" for our upcoming volume, Native American Classics. Editors Jon Smelcer, Joseph Bruchac and I have agreed to dedicate the book to Robby's memory. He will be greatly missed in the comics community. The book will be available in March 2013. -- Tom Pomplun, Graphic Classics PublisherFor more on the subject, see Review of Road to Medicine Lodge and Greg Burgas Reviews Native Heart. Shades of Seattle artist/Native American sculptor John Williams, shot to death in 2010 by police, who was partially deaf and while holding a carving knife. The shooting deaths of non-whites by police/Sheriff Deputies seemed to be more prevalent these days. Just recently in Saginaw, MI. A black homeless man was shot dead while holding a small 4" pocket folding knife. All 6 officers fired one or more rounds. Literally he was shot well over 15 times. Better yet, it was all captured on video. The man in question, was not threatening in any way, since it showed him walking away from the police. Don't believe anything the cops tell you. In most cases involving non-whites. The shootings are certainly not justified. Those massacres of one person like this are never justified. I wonder why they didn't taze him instead if they believed he was an actual threat? The article says the deputies tried to tase McMurtry, but failed.